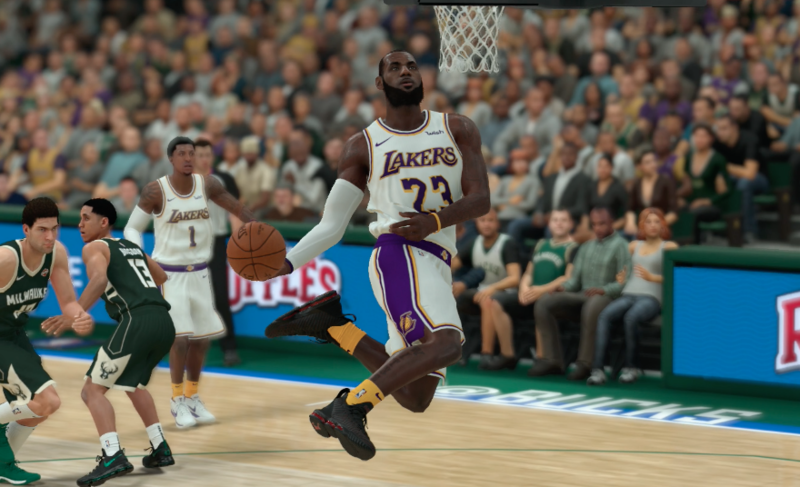 Opening Night of the NBA is finally here, and so is NBA 2K19’s Opening Night roster! In this article I pour through the file and write down any tidbits that I find at least somewhat interesting. If you find any other ones yourself that aren’t listed here, put them down in the comments! Lou Williams (SG, Clippers, 82) is the highest-rated Sixth Man. Montrezl Harrell (PF, Clippers, 76), Willy Hernangomez (C, Hornets, 76), Kosta Koufos (C, Kings, 76), Greg Monroe (C, Raptors, 76), and Shabazz Napier (PG, Nets, 76) are the highest-rated healthy players not in a NBA rotation. Terrance Ferguson (SF, Thunder, 69), Damian Jones (C, Warriors, 69), Jason Smith, (C, Wizards, 69), and Lance Thomas (SF, Knicks, 69) are the lowest-rated players in a NBA rotation. Giannis Antetokounmpo (SF, Bucks, 94; Greece) is the highest-rated international player on an NBA roster. Naz Mitrou-Long (SG, Jazz, 65; Canada) is the lowest-rated international player on an NBA roster. There are 492 total players on NBA rosters. 53 of them (10.8 percent) do not have their faces scanned into the game. The Bulls, Celtics, Knicks, Magic, Mavericks, Nuggets, Thunder, and Warriors all have a league-high 3 unscanned players. The 76ers and Trail Blazers are the only two to have none. Daniel Theis (C, Celtics, 74) is the highest-rated player on a NBA roster to not have his face scanned into the game. Travis Wear (PF, Lakers, 65) is the lowest-rated player on a NBA roster to have a face-scan. 34 of the unscanned players are rookies. The remaining 21 have a year of NBA experience. Among those 21, Daniel Theis (C, Celtics, 74) played the most games (63) in a season. 38 of the unscanned players are under two-way contracts. However, Trevon Bluiett (SG, Pelicans, 67) is not assigned his correct deal in the roster. Brad Wanamaker (SG, Celtics, 72) is the oldest unscanned player on an NBA roster. At 29, he is the lone unscanned player to be born in the 1980’s (Born July 25, 1989). Trevon Duval (PG, Bucks, 68) is the youngest unscanned player on a NBA roster at 20 years old (Born Aug. 3, 1998). The roster initially shipped with Jordan McRae and Christian Wood having generic faces, despite them having their faces scanned in recent prior editions of NBA 2K. However, that discrepancy was fixed in a mid-afternoon update. 54 of the 60 rookies selected in the 2018 NBA Draft can be found in this roster. Justin Jackson (43rd overall pick), Issuf Sanon (44th), Tony Carr (51st), Devon Hall (53rd), Arnoldas Kulboka (55th), and Kevin Hervey (57th) are the missing prospects. 50 of those 54 rookies have their faces scanned into the game. Chimezie Metu (49th overall pick), Thomas Welsh (58th), George King (59th), and Kostas Antetokounmpo (60th) are the odd men out. DeAndre Ayton (C, Suns, 79; 1st overall pick) and Luka Doncic (SG, Mavericks, 79; 3rd) are the highest-rated draftees. Kostas Antetokounmpo (C, Mavericks, 66; 60th) is the lowest-rated draftee. The Opening Night roster shipped with 23 injured players. The lone personnel discrepancy is Tyrone Wallace’s (PG, 70) absence from the Los Angeles Clippers roster. He was correctly added to the team in the Oct. 17 morning update. Next Post:#2KTuesday: NBA 2K19 Free Agents, Where Are They Now?